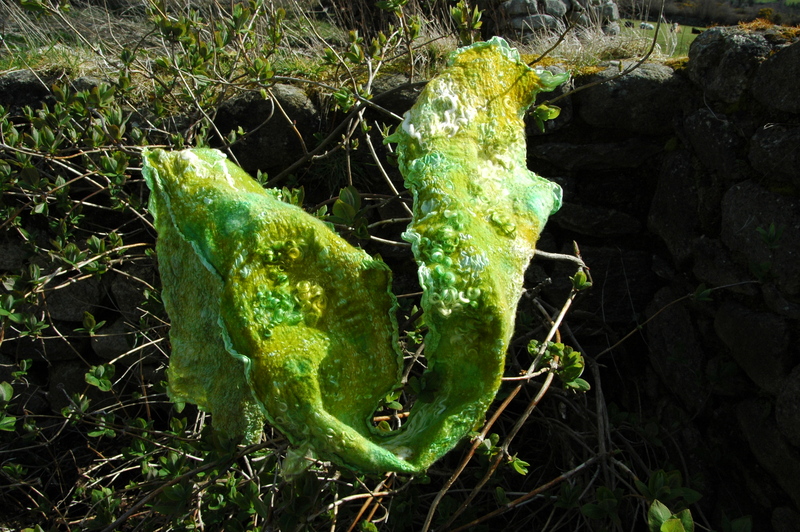 My first food colour dyed nuno scarf, American update and one space available next Wednesday to learn nuno felting! As promised here are some more musings re my first hand dyed nuno scarf experiment. Once I had zapped the scarf in the microwave for the second 5 minute session I left it in the bowl to cool down a little bit. As soon as it was cooler to handle I rinsed it out under running water before spinning with a damp towel and then hanging it up to dry. I absolutely adore the mohair locks combined with the nuno texture but wouldn’t include the corn fibres again for this type of work. As mentioned before I did know that they would not dye with the food colouring but because I intended the scarf to be various shades of blue and green I thought that the fibres would add a nice touch, I actually think that they don’t! I am happy however with the blending of the green and yellow colours which was carefully planned and not an accident by any means, oh ye of little faith!! The scarf seems to be amazingly soft after the process and I really don’t know if the dying altered the handle of the nuno felt or if it is just the addition of the mohair locks. Dying with food colouring is something that I will experiment with a little further as it was quick, safe and only required items already here in my house (except obviously the food colouring itself!). At the moment I am just trying to finalise the Michigan leg of my US felting trip this October. As soon as I have confirmed news I will post here and sort out the Californian and Oregan side of things, I can’t wait!!! I am teaching a nuno felting workshop here at Clasheen next Wednesday and due to the arrival of my new tables this morning (HURRAH!) have one space available for the day. Please email me asap if you are interested in attending. The cost is E75 for the day including materials and ongoing tea or coffee, silk fabric is a little extra (you can use cotton gauze or muslin if preferred) depending on whether you go for hand dyed or commercial silk. This entry was posted in America 2010, Felt, nuno felt, workshops and tagged dying with food coloring, dying with food colouring, Felt, felt scarf, Felting, felting worksho, felting workshop, felting workshops, food color, food coloring, food colouring, Nuno, nuno felt scarf, nuno felting, nuno felting workshop, scarf, US, wet felt, wet felting by Nicola. Bookmark the permalink. on my blog i show today my first hand dye experiments! your scarf is very pretty, i love the green colors! Oh I’d love to. It’s just not to be tho’, since I’m working all day Wednesday. Maybe sometime after your trip. Gorgeous colours! And I love the mohair locks. Your blog is fabulous and very inspiring! It’s lovely! Did you use only food colours? In the microwave? I have used acid dyes in the microwave for small dye projects, but didn’t think food colouring would work…did you use vinegar to help fix it or salt? This is FABULOUS – I’m going to play today! Well, probably not today because I have a rush order to fill, but soon! And I’m assuming the white fibers are the corn – I actually really like them. They really add texture and dimension. Two questions: 1 – was your silk hemmed or is it raw edges? 2 – Do you have to heat set the dye after microwaving? Also, your bag is here. I’m not sure if you’re getting my emails. I sent two – one included pictures of it. I love it. 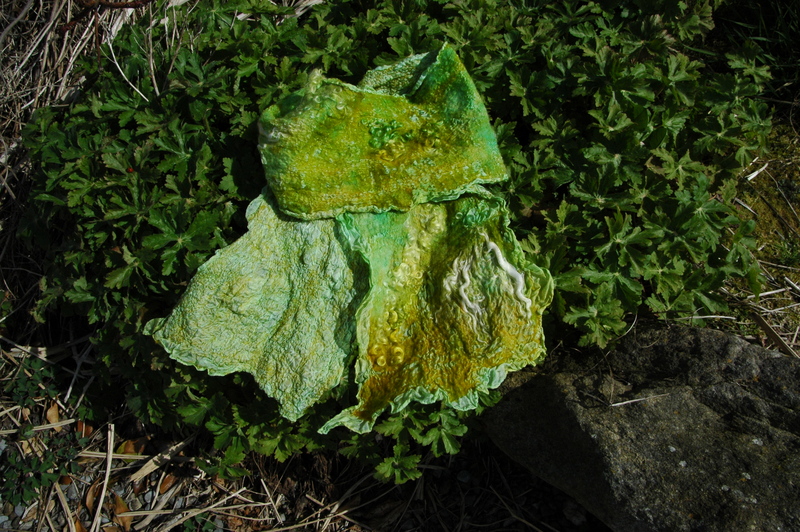 Goodmorning Nicola…………..I would love your ‘recipe’ for food color dyeing. Your color is wonderful. Cannot wait to see your schedule for the US trip. Lovely scarf, great texture. I have done quite a bit of dyeing with food colouring and it is excellent. And yes, I found too that it doesn’t work on all fibres. I’ve combined it with tie dyeing and also tried it on needlefelt and the results are great. Unfortunately there just aren’t enough different food colours available so you can only go so far with it. A couple of projects I have tried which worked out well were a small felted bowl, which I felted in white wool fibres and wensleydale and wool nebbs for texture and used cochineal for the bottom half (filled the bowl of water and vinegar only half way up) and then turned the felted bowl upside down and changed the colour. I will post some photos on my own blog when I get a chance and let you know. Another project that went very well was a plain white wool roving scarf which I twisted and folded up in the water bowl and then kept changing the dye colour as it absorbed so ended up with a lovely multicoloured scarf. I’ve also used it to dye pieces of needlefelt to use in other projects. Its great, especially if like me you have small children in the house and need to be extra safe. Have you tried ecocolouring? It looks interesting!